LittleBits, which creates small hardware parts akin to electrically-charged Legos, has secured funding that will help the fledgling start-up meet demand and make new products. The New York-based module-making company has raised $3.65 million in a Series A round led by True Ventures, with Khosla Ventures, O’Reilly AlphaTech Ventures and Lerer Ventures also contributing to the funding. LittleBits had previously received seed funding from Joi Ito, Nicholas Negroponte and Joann Wilson. 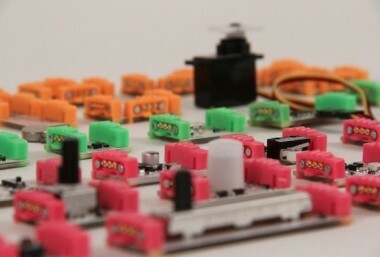 The littleBits are sold as both individual parts and as kits. The company’s flagship product, the 10-piece starter kit, sells for $89. There’s also a teaser kit, with just three bits, for $29. Founder, engineer and MIT Media Lab alumna Ayah Bdeir says littleBits’s biggest customers to date have been parents and kids, and there’s a strong customer base in teachers and educators, as well. In the three weeks following last September’s launch, littleBits sold more than 3,000 kits. In February of this year, the company won the Popular Science “Best of Toy Fair” award, beating out bigger toy companies like the Lego Group and Mattel Inc. Since then, Bdeir says, demand has increased. In addition to securing funding, littleBits has also established a partnership with global supply chain management company PCH International, which will take over production of littleBits in August of this year.